A few weeks ago, the awesome Jessica from How Sweet It Is posted an incredible recipe for Crockpot Coconut Hot Chocolate and I literally (think Chris from Parks and Rec) have not been able to stop thinking about it. First of all, anything in the slow-cooker is gold in my book, but hot chocolate? Holy, genius. A quick Google search showed that apparently I am super late coming to the ‘hot chocolate in a slow cooker’ party, but then again, I tend to be that way with everything. What can ya do? And guys, I just loooovvve hot chocolate. Like love it, love it and will find any excuse to buy it/make it/drink it. When I was little, my family would go to this pancake restaurant in town and I would always order hot chocolate to drink. The main reason being it came topped with an obscene amount of whipped cream and a giant handful of mini chocolate chips. A few minutes after it’s arrival at the table, the magic would start to happen. The whipped cream would melt, dropping all of the chocolate chips into the hot chocolate and creating a melty-fudgey floor on the bottom of the cup. Crazy good. At least to a 7 year old. Or a 30 year old, apparently. I wanted needed to try my hand at hot chocolate in the slow cooker. This couldn’t be something that I lived without for even one more day. With my current obsession being peppermint and chocolate, I just had to go the peppermint route. Last week, I picked up these cute little Andes Peppermint Crunch Baking Chips without a clear plan in my head. I saw them, noticed that they were peanut free (score!) and quite frankly, adorable – so I had to get them. I just had to. that quickly found their way into my cart as well. I had no idea how the Andes Peppermint Crunch Chips would melt, but oh…my…goodness! I needn’t have worried. They melted into an incredibly smooth and minty goodness. That combined with the rich and thick melted chocolate easily made this the best hot chocolate I have ever had. In fact, I’m getting sad sitting here writing about this hot chocolate and the fact that it’s gone. I really need to make some more. Bonus: We had some leftover so I jarred it up in one of my trusty mason jars and popped it in the fridge. The next day I reheated it in a small saucepan over a super gentle heat and it turned out perfectly. Try it after you make some. That is, if you have any leftover. Combine all ingredients in a medium sized (I used my 4 quart) slow cooker and stir. Cover and cook on low for 4 hours, whisking once half way through cooking time. 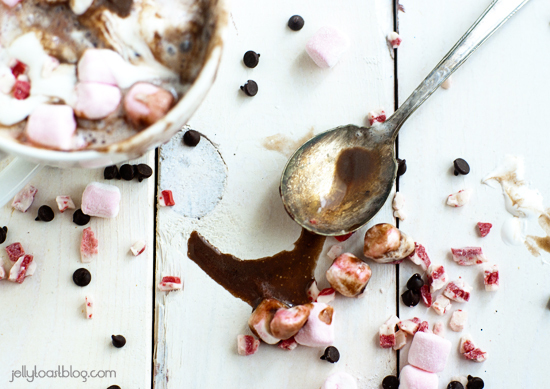 Serve hot and garnish with whipped cream, peppermint marshmallows and mini chocolate chips. I just love parks and rec! Was loving it last night with Jerry’s party. I’m glad you like the hot chocolate! Thanks for saying hi. That first shot is so gorgeous! It belongs on the wall! that looks delicious! photos are great! Thanks, Jessie! I made another pot yesterday because it was completely in my head…I need an intervention. 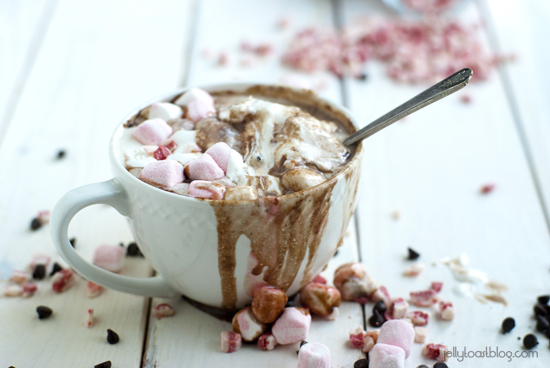 This hot chocolate looks incredible! Just want a big cup right now and sit right next to the tree. 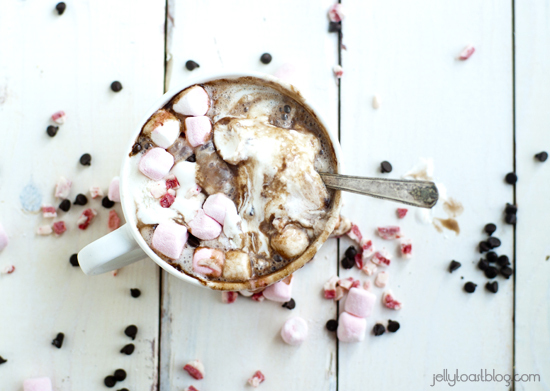 Yeah, I need this hot chocolate in my life pronto! yes, you won’t regret it! 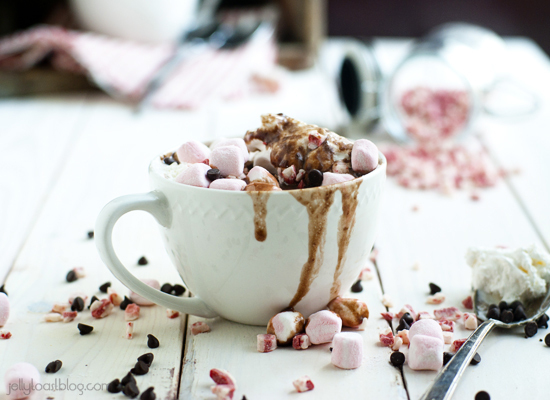 BEAUTIFUL photographs — I love the chocolate dripping down the sides, and the pink marshmallows are too cute! I made this tonight and a weird film formed at the bottom and when I stirred it, the film got mixed in with the hot chocolate and little bits of the film went in with each sip…gross! What did I do wrong? Hot chocolate is my favorite winter drink and I literally make a pot every night, but this was my first experience in the slow cooker. That is weird! I have made this several times and never had that problem. Occasionally a film tries to form on the top if I don’t whisk it, but a quick whisk usually fixes things. 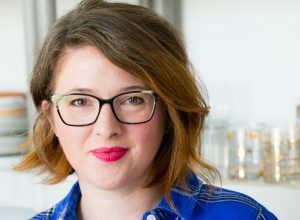 I would suggest whisking multiple times, instead of just once halfway through the cooking time.